This artist designed Despicable Me 16-inch square pillow cover features Minion Carl, that short one-eyed Minion with buzz-cut hair from the Despicable Me 2 film. Also referred to as “Bee-Do”, Minion Carl is best remembered in Despicable Me 2 when he charges into Gru’s office after Gru sets his telephone on fire while trying to get the courage to ask Lucy on a date. In the scene, while two Minions try to extinguish the fire, Minion Carl, complete with red emergency head lighting and a hand held megaphone, tries to act like a fire siren and alert system. This annoys the other Minions and Carl ends up getting sprayed by Stuart with a fire extinguisher, which knocks him across the room. The artist has taken the annoying “Bee-Do” sound and has turned it into a cute design, with Minion Carl on a red and white decorator throw pillow. This pillow cover is made from 100 percent washable polyester poplin fabric with a concealed heavy duty nylon zipper making removal easy for cleaning. Use it to cover an existing “tired” throw pillow for a fresh new look. Also available in 20×20 inch and 18×18 inch sizes and WITH a hypo-allergenic, down alternative pillow insert — it can be purchased with your choice of INDOOR or OUTDOOR spun polyester poplin fabrics. Consider decorating with larger size throw pillows because they provide a much cleaner look than a jumble of smaller ones. Brighter colors and designs on a tightly woven fabric like poplin can add just the right splash to brighten any room. 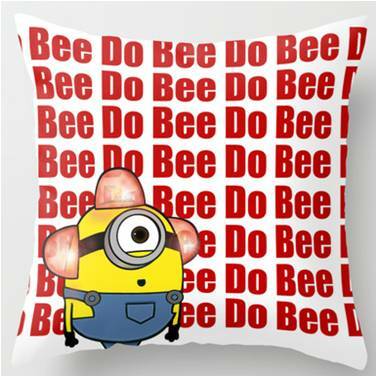 This is a PREMIUM 16-inch by 16-inch, red and white zippered throw pillow COVER featuring an artist’s design of Minion Carl from Despicable Me 2 in his role as “Bee-Do”. The identical artisan design is showcased on BOTH SIDES of the zippered cover. The washable pillow cover is made from 100 percent spun polyester poplin making it very durable yet removable for cleaning — it features a convenient, concealed heavy duty nylon zipper. For cleaning, simply unzip and remove the cover from your pillow. You can pre-treat any stained or soiled areas with a color-safe spot cleaner or spray. You may also use a damp sponge to remove any stains. Wash the Bee-Do pillow cover in cold or warm water using a mild detergent. Using bleach is not recommended. Allow the Minion Carl cover to air dry or tumble dry on a low setting. This 16-inch by 16-inch throw pillow cover is available in 20-inch by 20-inch and 18-inch by 18-inch sizes. Purchase with your choice of either INDOOR or OUTDOOR spun polyester fabric. This design is also available as a 2×3, 3×5 or 4×6 throw rug — Check it out HERE. Because this is a PREMIUM artist’s design, the pillow cover is made to order and will ship in 3 to 5 business days. Prices will vary based on your selection of pillow size and whether or not you choose a pillow insert. Pricing has been determined by the supplier and not this review website.